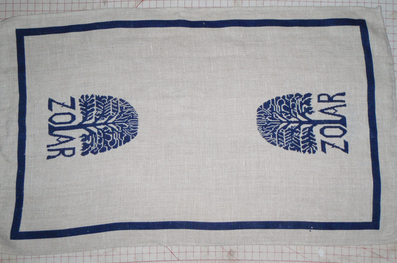 Here are the two tea towels I have had for twenty years and now it is time to make one of them into a quilt! Zoar is a historic town in Ohio that was founded by German Separatists when they left their homeland due to religious persecution. It was also the site of a Civil War fort and they still hold reenactments there. The population – 169 as of 2010. Which one should I choose? Hum? 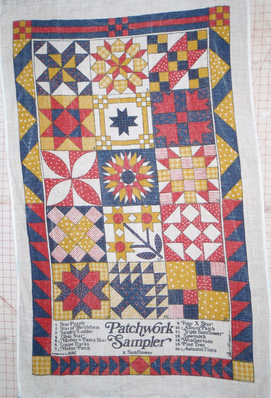 I have that same patchwork sampler towel that I bought for my mom as a gift in 1978. She recently gave it back to me. so the question for Patty is: do you want another one and you could make a square medallion by sewing them side by side? Brenda, Sure why not?! Doesn't make you wonder how many are out there in the world? I will add this tidbit to the label when I get it finished! Thanks!